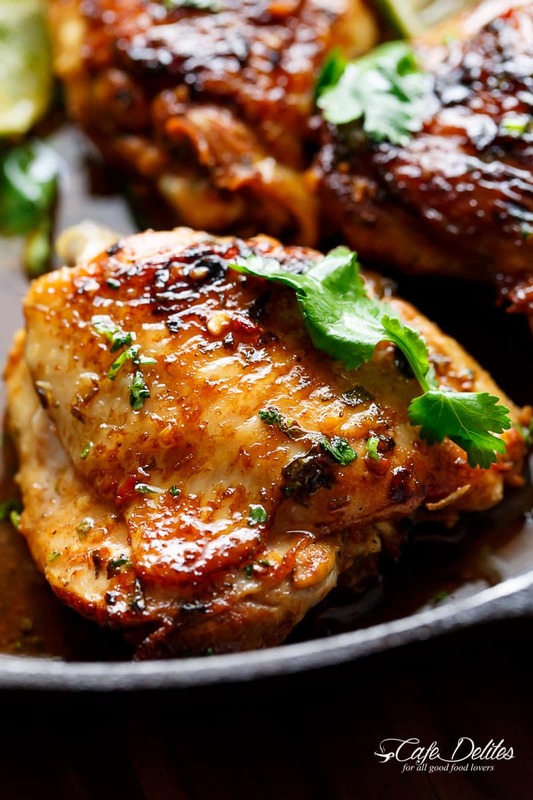 Heat the remaining one tablespoon of oil in a non stick pan or cast iron skillet over medium-high heat. Add in the thighs along with any marinade left over in the bowl, and sear chicken -- skin-side down -- for 4 minutes on each side until golden and crispy (chicken will not be fully cooked). I was looking for a chicken recipe for the whole family and I stumbled on this article. I read and followed the instructions carefully and I made it deliciously! Every member of my family is so happy! Thanks for this! 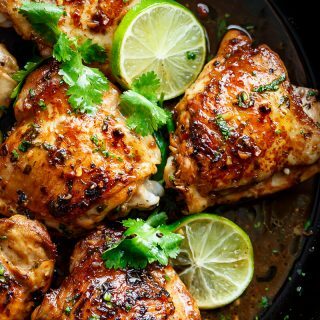 Is it ok to marinate it longer than 15 minutes? Maybe 2-3 hours? Everything I have tried here has been a 5 star. My sister is clueless in the kitchen and so I am double cooking and sending her some of these on dry ice. I would like to try my air fryer with this recipe. Has anyone else attempted it? It does make food crispy. Yum. this was absolutely delicious. thankyou. Very easy to follow and super delicious!!! I used honey instead of brown sugar to make this keto/paleo. I also baked the chicken on a metal cooling rack set on a cookie sheet so it was nice and crispy! Served over cauliflower rice with sweet potato fries. So delicious!! 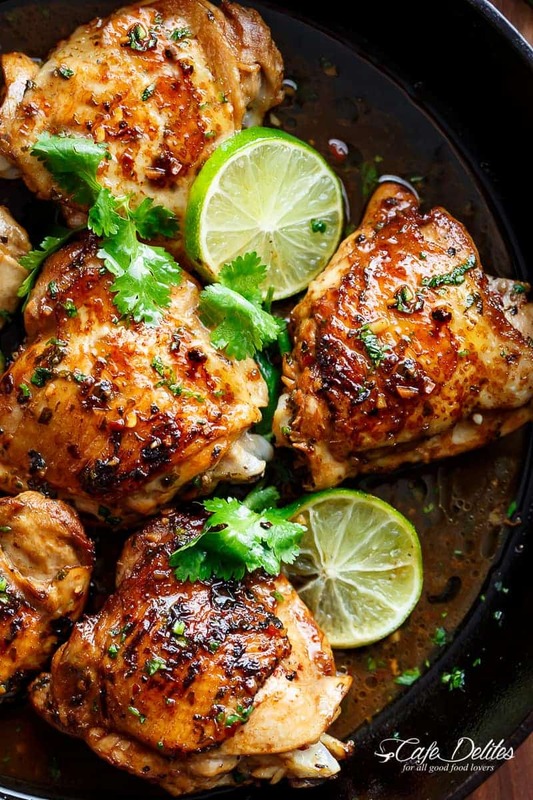 This was very delicious and is now my go to recipe for cilantro lime chicken. I served with Mexican fiesta corn on the side. Made this today. Fried double the time in the recipe to get crispy crust and baked skin up for 25 minutes then turned off and left in oven while preparing rice and Bush’s Fiesta Black Beans. There was nothing left of the marinade to put over the rice, but was excellent with the Bush’s Fiesta black beans. Love this recipe. Love this! I’m a self-admitted lazy cook and this was super easy to make without compromising on flavour. I didn’t have cumin so I substituted with garam masala and it worked out well. Love this recipe! I have made it many times. However, even though I follow the recipe I can never seem to get the skin crispy. How do you get the skin to be crispy instead of just flabby? Well, I screwed up and got chopped basil instead of cilantro. Put it in the recipe …. not bad. When I make it again, will make sure to use cilantro & maybe add more lime juice. Despite, my mess up, still a great meal. The chicken was so moist!! Thanks! This turned out great, I used bottled lime juice and 4 tbls is sweet chili sauce and taco seasoning along with salt and pepper to taste. It is def a keeper. Thanks for sharing. I made this tonight. I pretty much followed the recipe except after I seared the chicken for 5 mins, I lifted the chicken out of the pan and added baby potatoes and browned for 5 mins. I then added the chicken back to the pan and popped it all in the oven. Amazing!! Tasted so good and such an easy one pan dinner. This was amazing! Thumbs up from the entire family! Thanks so much for sharing! So good to hear Debbi! Thank you for sharing that with me! Made this 4 times and it’s delicious ! This is perfect for those summer nights! Thanks for the post and the idea! Hi Kasey. There are many different on line calculators you can use to work them out. 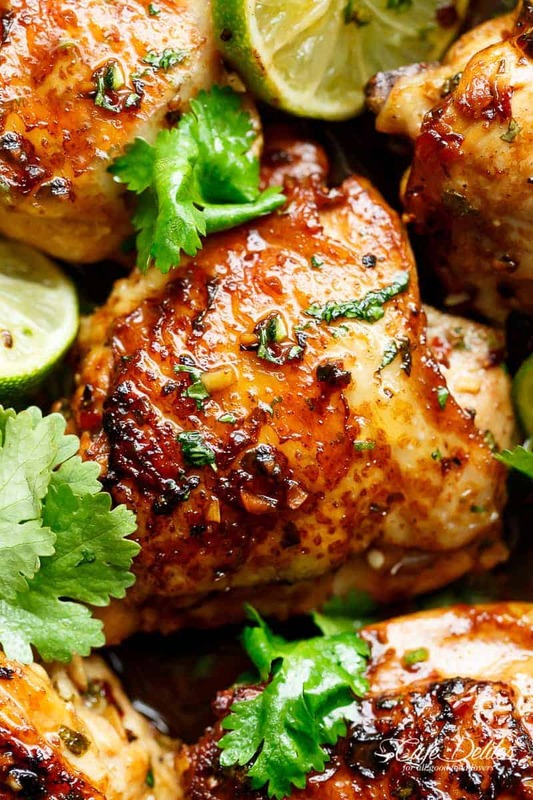 This looks so good!.Is it possible to use boneless chicken breasts instead? Yes, the cook time will be longer because the meat is thicker than bone in. Looks good! Going to make tonight. Funny the video shows parsley as an ingredient but the written recipe doesnt mention it. You are absolutely right – crispy chicken skin wins every time. This recipe sounds delicious! I just love all your recipes I’ve been trying really hard to eat low carb, I wished you’d put the nutrition info with the recipes some of the them I can calculate but when your only eating 1200 calories a day every calorie counts!!! Thanks for all the great meal!!! I am tryin with chicken breast, should I sear still or just bake? This looks so delicious. Can I use drumsticks? Grilled Pork and Onions Caribbean-Style: Makes 4 servings. In a bowl combine lime juice, oil, crushed garlic cloves, salt, coriander, and cayenne pepper; set aside. Arrange thinly sliced onions in a large, shallow dish. Arrange pork chops over onion slices; pour reserved lime marinade over all. Cover and set aside at room temperature for 30 minutes, turning often. Excellent dish. I have recipe for pork chops that’s almost identical. Substitute cayenne for the red pepper flakes, pork instead of chicken, slice 2 onions. Place chops and onions in plastic bag, pour in marinade. Grill chops and onions on the grill. One of my wife’s favorites. Scott! I’m going to try your version. Sounds delicious! This chicken looks amazing!!! Your photos are always gorgeous! !